Listening to Grayson Perry giving the Reith lectures this year was very entertaining, although reviews were mixed. One snippet I picked up on was the result of a survey that was done in various countries which asked people what sort of art they liked. The response was overwhelmingly a landscape with figures and animals in the foreground and mainly in blue. This MIGHT explain why I don't bank in Jersey or the Virgin Islands.Maybe it's because I didn't learn how to do blue landscapes with figures and animals at art school and my latest work doesn't fit into this category either. I've embarked on a series of glue gun drawings called Pink Graffiti Lorries which, as you may have noticed, is, according to this survey, as far away from the ideal art of many people as it's possible to be. I started these earlier in the year before the Reiths - so have I got an inbuilt contrariness to comply with what people would love to have hanging on their walls? When I was an art student an aunt asked me if I could paint her a picture. What she wanted was a seascape with (yes) horses in the fore ground and (yes) mainly in blue. I sensed a bit of beer money coming along so I started to paint. At the beginning it was a bit horsey and a bit blue, but it soon mutated into a hellish scene with a dragon - like beast in front of a blood red sky. I wasn't able to buy a round that week. Not long after, I did sell my first piece of work AND no-one told me what it should look like. So how does an artist decide what to do their art about? Grayson Perry said that after a lecture once a student came up to him and asked him that question.He ummed and aahed for a bit and seeing that she had an i phone in her hand he said 'Well I didn't have one of those. She has access to any image or information. When I started I had none of that." As I'm a bit older than Perry I also didn't have access to the internet when I started. 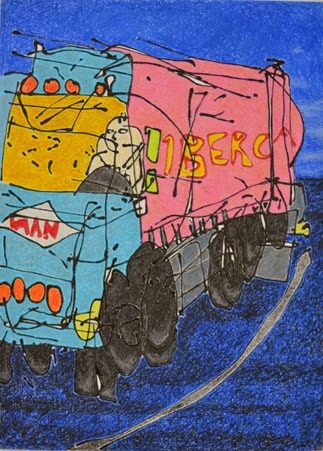 So, maybe, as More Mature Artists, we are not hung up on search engines and can look around and say, for example, I'm going to draw those lorries and colour them PINK!